We met the folks from BitScope some months ago to talk about their plans for a miniature scope especially for the Raspberry Pi. They’ve just launched the product we discussed today, and our socks have been comprehensively knocked off by it; the engineers who sit behind me think this is one of the most exciting Raspberry Pi add-ons they’ve seen so far. This is the BitScope Micro, built especially for the Raspberry Pi. It turns your Pi into a dual channel digital oscilloscope, a multi-channel logic analyser, a waveform and clock generator and a spectrum analyser; it comes bundled with BitScope’s full suite of software (well worth a look if you’re even slightly interested – this thing has features coming out of the wazoo), and it’s probably the cheapest digital scope we’ve ever seen, coming in at USD $95 if you buy in volume, and $145 at one-off retail. You can read much more at BitScope’s website. We think that’s an incredibly good deal – for the same analogue bandwidth in a bench scope you’re looking at an instrument that’s many, many times the price, even at retail. The BitScope Micro comes bundled with ten signal clips and a USB cable. It’s exciting for us to see proper scientific instrumentation coming to the Pi; we’re looking forward to seeing what the community does with tools like the BitScope Micro. Give us your ideas in the comments. Right, that’s a $150 well spend then :-) My order will be in shortly! Thanks for making this amazing tool folks! Not sure what you are on about. The price is $145, which will need to pay for the item itself, plus a lot of development (and there was indeed a lot of development). Having been in touch with the Bitscope guys during their SW development, they have spent a huge amount of time and effort analysis X Windows and the QT library to make their application run as fast as possible, and a lot of that work will have spinoffs in speeding up the Pi overall, so thanks Bitscope! Hope the product does well for you! Try the Bitscope website – the link is in the article. Please can you add the specifications (bandwidth, memory, speed, potential range, etc…) on the website? If this is the cheapest scope you’ve seen, you haven’t really been looking. With just a attiny processor and a few components you can solder a scope yourself for around 5 euro. It won’t have (m)any safety features, you’ll have to find/write some software for it, it’s probably not as powerfull/versatile and it isn’t designed specifically for the Pi, but did I mention how cheap it is? In what way is the BitScope Micro designed specifically for the Pi? It seems to be a regular usb device. You are making a little mistake. The real price would be 5€ + the price of the PC. Sure, you need to connect it to a PC (or Pi) with a monitor attached to have a setup you can use like a standalone scope. But that is also required for the BitScope Micro. Their kickstarter campaign seems to have been very successful! It is surprising how many people do not see that the price of a complete scope including the computer needed to run it with the features this has are being compared to a device that in many cases requires that you still buy and haul around a laptop computer where the pi version BitScope is a complete very portable package. The piScope or BitScope is like other pi projects, Don’t act like someone is claiming that this will revolutionize oscilloscopes and circuit probing. It just another exercise in what we can do when we put our thinking caps on but in the case of the BitScope to the degree of real world usability cost effectively. Love this. Anybody knows what can we expect for the Analog Bandwidth ? eg. 1MHz / 10 MHz / 100 MHz ? From the website 40Msps so 20MHz would be the maximum analogue signal (Nyquist). You think that sampling at 40Mps means you can look at at a 20MHz sinewave? It’s a bit more complex than that. Nyqists theory says that if you know your signal is band limited to a frequency n then you can represent it completely by sampling it at frequency 2n. But real signals are rarely band limited, they have lots of harmonics and you generally want to capture at least up to the third and prefferablly also the fifth harmonic without aliasing to get a reasonable approximation of wave shape. So if you are working with a scope on signals with a fundamental frequency n you probablly want a sample rate more like 10n. Ok I saw it’s 20MHz. Well done. Will buy soon. Just need to collect the cash first. Impressed though .. Pardon my ignorance, but what is Bitscope? Essentially it performs the function of 5 separate electronic test instruments – at very low cost. The way electronic devices work is by varying voltage over time. When you hear music, that hit the speaker as a varying voltage of great complexity. This is an analog signal. At the heart of it, all electronic signals are analog, but digital signals work by constraining the set of voltages that will be taken seriously to two ranges – typically 0 and 3.3 or 0 and 5 volts. 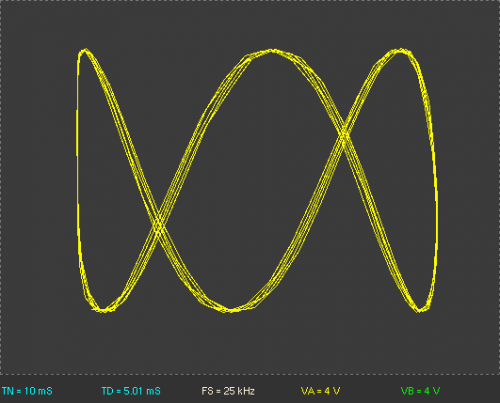 So an oscilloscope lets you graph the analog signal in realtime. 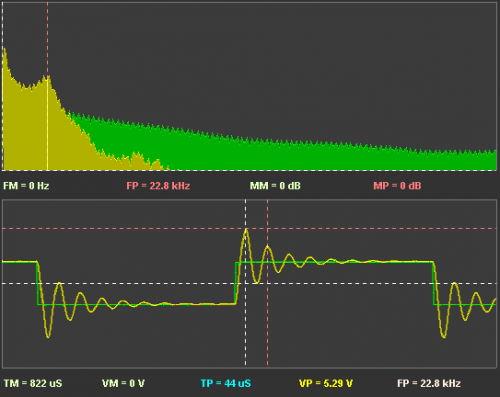 A logic analyzer lets you do the same thing with a digital signal. You can actually watch the analog or digital signal change over time. This is tremendously useful for debugging hardware, and also for understanding how two pieces of equipment are talking to each other. It’s stunningly simple once you’ve played with it a bit—not at all something you can’t understand. The fact that you can get a 20mhz storage ‘scope and logical analyzer for $150 is amazing. Every teenager who is interested in how electronics work should have one of these. We used to have a small, 8-channel logic analyser for technical colleges and the like. 10 meg. bandwidth, 1k capture memory. Output was to a VGA monitor. Sold for about £1,000. Cheap as chips. This thing knocks it into a cocked hat! Brilliant, and a very realistic price. OK…. You’re correct the price of test equipment. Several years ago, I worked for a manufacturer’s rep firm in the U.S. The least expensive bench digital multimeter we sold was $895. It did not have the o-scope or waveform generator, etc. I was just searching last night about an ocilloscope for the pi… and now one appears for ~£90! Not bad for what you get. it doesn’t look too bad, but after all the extras you’ll need the existing stuff you can buy isn’t that far behind..
I’m used to my benchtop scopes, but I’m curious to see how people like this device. With no physical knobs, I am sure the control software has a big impact on usability, for better or worse. Also the webpage says: “…tiny light weight water resistant mixed signal probe!” I’m interested how an uncased PCB is considered “water resistant”. How much salty water can you drip on it when powered up, without adverse effects? I think this thing looks awsome. I just wish the price was lower. The cost of entry for many hobbyiests is too high when it comes to ocilloscopes. This unit looks very promising and if they were to get the price down to $99 for single unit purchases it would make my bday or xmas this year. Of course, the performance of the the bitscope is orders of magnitude better. This looks nice, but not fabtastic value for money. The same money would buy you a DSOQuad pocket storage scope with probes and battery and screen (72MS/s). For half the price you could get a 32 channel 200MHz USB OpenBench logic analyser. Still, if the software is very good that would be worth a lot. Please could you provide series of tutorials for those of us that do not know what an Oscilloscope is or What to do with it. An oscilloscope is a device that shows you how the voltage on a particular point in a circuit changes over time. It does that by measuring the voltage in very rapid succession and then displays each measurement on a screen, as a simple dot. All those dots make a line so you can see the relevant changes in the voltage in context. This can be used to check if a circuit is working, by comparing the measurements to the calculated theory (i.e. what it should do) and if it doesn’t, find where the error is. But correct the abbreviation for second… lower case “s”..
‘scopes don’t usually measure electric conductance (Siemens .. big “S”), but time. I have been using a similar scope for several years now and have found it to be a very useful instrument. If you’re new to electronics, I’d suggest picking up one of these scopes to deepen your understanding of electronics. There’s a lot of stuff happening on in digital circuits that introductory books simply gloss over because it doesn’t fit the discrete world of 1’s and 0’s or unnaturally crisp waveforms. They’re also useful in understanding analog circuits since it’s easy to look at different parts of the circuit, rather than just the inputs and outputs. I need one of these! I bought a DPScope a year ago, which is nice. But when my Windows laptop died I bought a mac, so DPScope (Windows only) became a lot less useful to me. I travel a lot, so a portable USB scope that works on Mac AND Pi is a totally awesome idea. Hook it up to HDMIPi and a Pi and you have a portable scope that can run off batteries = awesome! I have been watching Bitscope since they were a kit in Nuts & Volts. I will surely but this one as an addition to my Pi! Sounds great – Will think of buying one when I can find the money. I’ve been wanting to get a scope for a long time. I’ve used them at college and university, but never been able to justify the cost of buying one myself. One thing that has put me off is the cost (many cost hundreds of pounds), but also the lack of Linux support – as (except for work) I use Linux almost exclusively. There are cheaper alternatives, including using an Arduino as a very basic scope (which are worth considering for a very basic scope at low cost), but this looks like a professional quality scope for a fraction of the price of most others. I haven’t seen the cost of postage to the UK, but less than £90 excluding postage is great value. I assume this can be used with any Linux computer, not just the Pi? It seems to just use USB not GPIO. Is the software any good, the problem with kit from e.g. Saleae is awful software, and barely any of it works on Linux. Anyone know how much shipping is, usually its extortionate from the States, and is there tax on top of the ~£86? Note: Bitscope is located in Australia, not in the US. Maybe resellers will import in bulk to save on shipping. What? $145 USD for qty.-1 of this thing?! With the published sample rate you would be Lucky to get 5MHz (max, with generous tolerance for aliasing) analog bandwidth. Heck, today for around $400 (or even less if you shop carefully in the U.S.) you can get a decent 100MHz (analog capable BW) dual channel stand alone Digital Sampling Oscilloscope (DSO) with decent sampling depth too. Unless someone can clear this up for me, this thing is hype; if not an outright rip-off. By the way, if you want a reasonably capable open-source expandable 200Msps logic analyzer, look at the fifty buck Open Logic Sniffer from Dangerous Prototypes. This looks great, I plan on getting one. I note that Pimoroni are stocking Bitscope now, so you can avoid that by shopping with them if you’re in the UK. New how-to animation – special guest star!